It's spelled "Mike Wazowski" but whatever, I suppose. I can't seem to find the fail, where is it? it looks like the little one eyed monster from Monsters Inc. Extremely creative, but sad none the less. nom nom nom. I have only one eye and a mouth. I will eat you nom nom nom. Why do I expect it to say "om nom nom" soon? So if I were to walk up behind him and punch him, he'd see it right? This is photoshopped. Cyclops wouldn't be caught dead with earrings on. hey look it's MIKE LAZOUSKI ! A beard would go nicely just under cyclops' mouth, . . . Oh, wait. I've got my eye on you!!!!!!!! is that line a part of the tattoo or is his head that misshapen? Is that Sloth from the Goonies? "Hey you guys"! 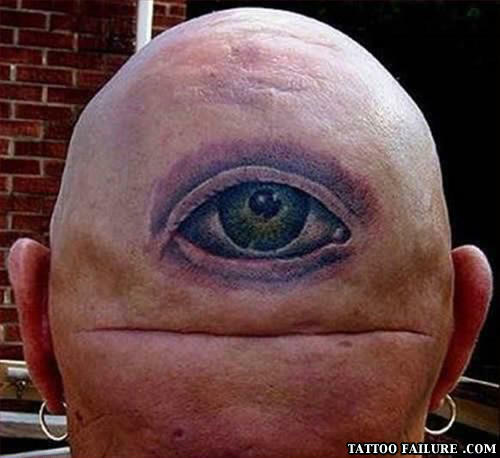 Im not so much weirded out by the cyclops eye as I am by that giant crease in dudes head. What the holy hell is that? The eye of the be bolder! Wow...anyone ever seen the movie Krull from like 1983? There's a cyclops who resembles the back of this dude's head... WEIRD. does his wife have an odysseus tatoo....o wait wife?